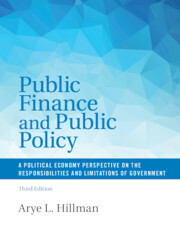 Public Finance and Public Policy Hillman Arye L.
Add to cart the livre of Hillman Arye L.
This new edition restructures and updates the political economy view of the responsibilities and limitations of government. Public-choice and behavioural concepts are prominent. Gender issues are included. Technical concepts are explained from first principles. Economic theory is rigorously applied. Excessive technicality is avoided. The book integrates traditional public finance topics - taxation, public goods, externalities, and income redistribution - with political self-interest, bureaucracy, voting, rent seeking, corruption, and the common-pool problem of public spending. Social justice is viewed as income equality, equality of opportunity, or the right to benefit from one's own effort. Public policies studied include the environment, education, health insurance, welfare payments and entitlements under moral hazard, unemployment insurance, paternalistic impositions, and defence and public safety. This book is ideal for advanced undergraduate and graduate courses that combine economic theory with a real-world perspective on the politics of public finance and public policy. A broad scope makes the book suitable for students in all countries. Part I. Personal and Public Finance: 1. Markets: personal finance; 2. Government: public finance; Part II. Responsibilities of Government: Efficiency: 3. Public goods; 4. Social costs and benefits; 5. Restraint on personal choice; 6. Information and efficiency; Part III. Responsibilities of Government: Social Justice and the Rule of Law: 7. Social insurance and moral hazard; 8. Social justice in taxation; 9. Social justice without government; 10. The rule of law: protection of life and property; Part IV. Limitations of Government: Politics and Policies: 11. Voting and the common pool problem; 12. Politics and efficiency; 13. Politics and income distribution; 14. Personal incentives in government; Part V. Concluding Overview: 15. The growth of government and the need for government; Appendix A. Topics in public policy; Appendix B. Supplements. Arye L. Hillman's professional career has been at Bar-Ilan University, Israel. He has, as an invited professor, taught at University of California, Los Angeles, Princeton University, New Jersey, the University of Paris 1 (Panthéon-Sorbonne), the University of Freiburg, and the Australian National University, and has been an invited fellow of the Japanese Society for the Promotion of Science. He is a joint recipient of the Max-Planck Prize for Humanities Sciences. He has an honorary doctorate from the University of Genoa. He has a B.A. (first-class honours and the University Medal) from the University of Newcastle, New South Wales and a Ph.D. in economics from the University of Pennsylvania.